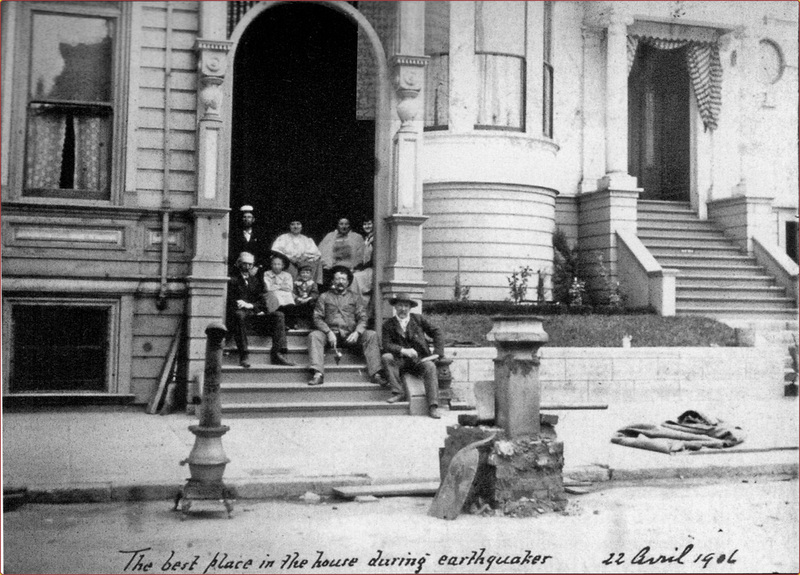 At 5:12 a.m. on Wednesday, 18 April 1906, an earthquake violently shook San Francisco and the surrounding area. The earthquake caused significant deaths, injuries, and property damage. The primary cause of death and destruction in San Francisco was due to the fires that burned out of control through a significant portion of the city for three consecutive days and nights. Contemporary reports state that more than fifty fires were burning throughout the city. After the fires had burned-out, the Federal Government gathered information as to the extent of the fire damage. 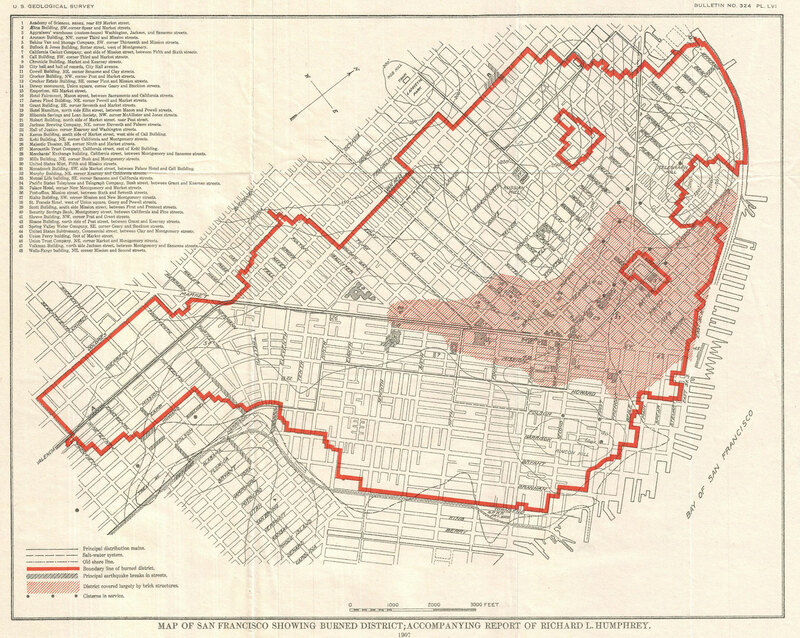 The U.S. Geological Survey in 1907 published a map showing the area destroyed by the fire. You can view the 1907 Geological Survey fire map here. More than one hundred thousand San Franciscans were left homeless; almost all of San Francisco's park lands and the Federal Government's open lands in the city were used as temporary housing areas. The Presidio military base and Golden Gate Park were among the many locations where people put up tents, tarpaulins or small wooden shelters. THEN This photo was taken from Mission Dolores Park, a San Francisco park used as a site for temporary housing after the fires were extinguished. The large building ahead, built in 1896, is Mission High School. The road just to the right of this picture and out of view is Dolores Street, a street with a wide median strip separating opposing traffic, see below. If you look at the Fire Map, you will observe that Dolores Street was a boundary point of the fires. Fire destroyed a significant number of buildings in the Mission District. 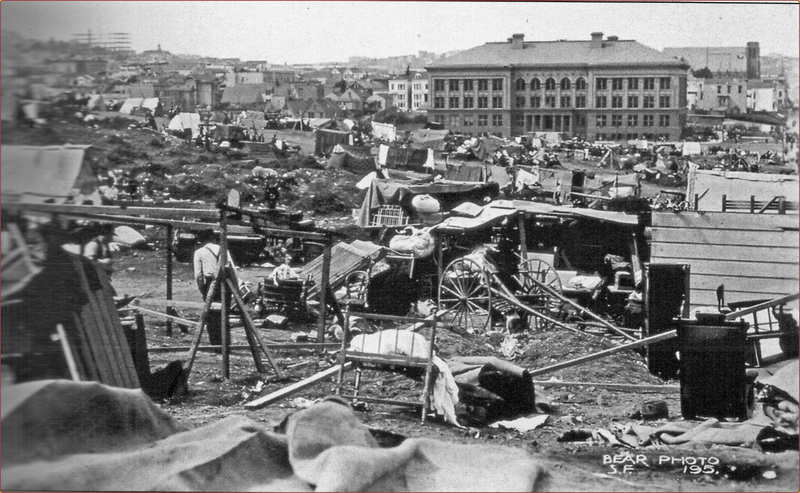 By the time this picture was taken many temporary shelters had already been constructed. The view is looking north. (Courtesy of California Historical Society, G-1379.) Click on the image to see the full-size photograph. Dolores Street This photograph was taken in 1944. 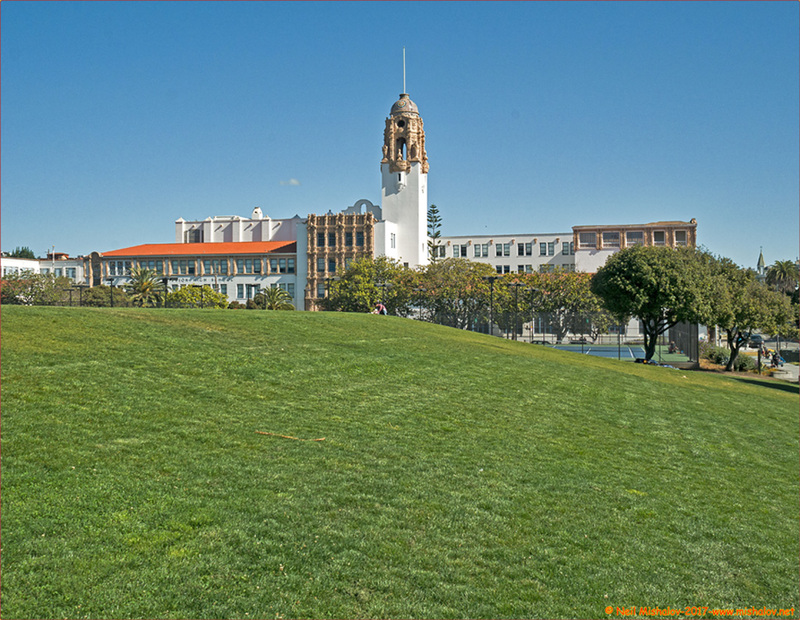 Mission High School, built in 1922-27, is visible, as is a portion of Mission Dolores Park. 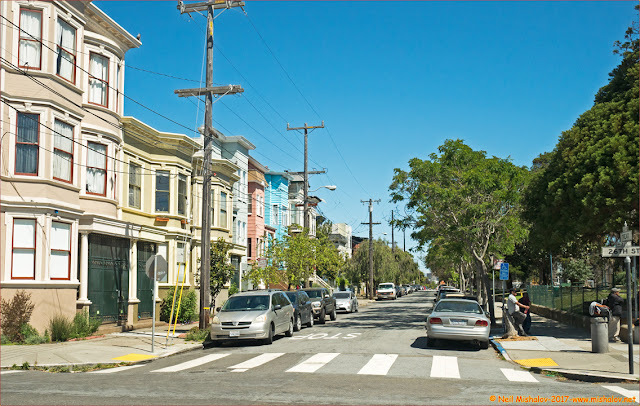 This photo was posted to show the width of Dolores Street. It is likely that the street acted as a fire barrier in April 1906. The view is looking north. 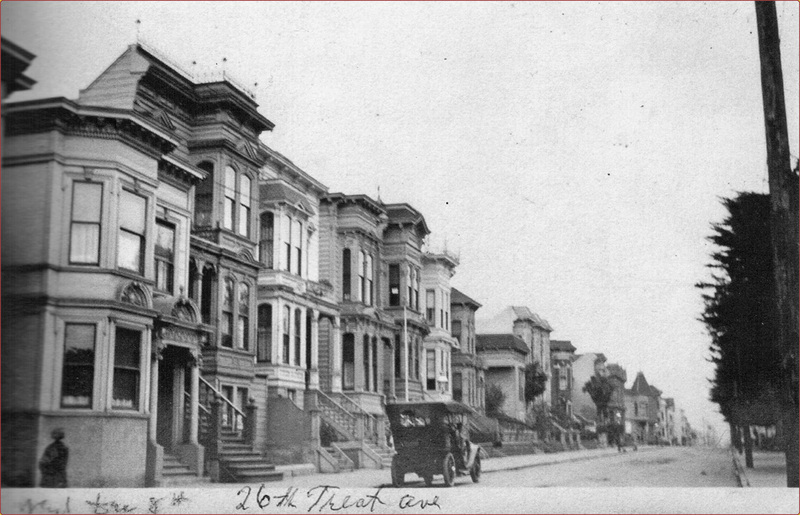 (Courtesy of California Historical Society) Click on the image to see the full-size photo. 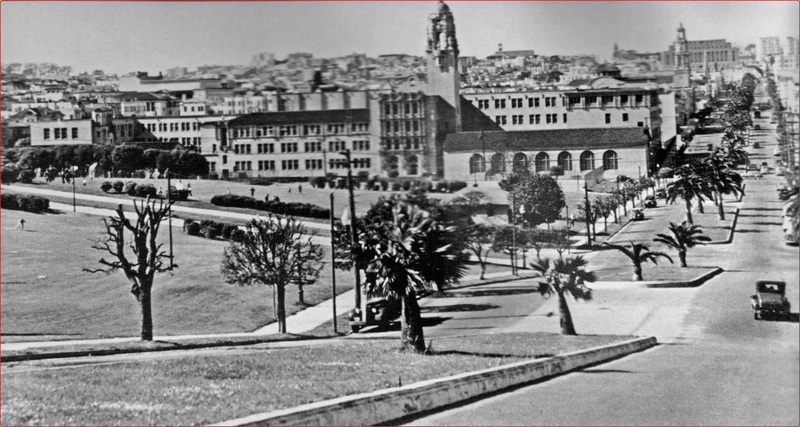 NOW The original Mission High School survived the 1906 earthquake and fires. Mission High School was destroyed by fire in 1922 because of a faulty heating system. The high school was rebuilt, and students were able to re-attend classes in 1927. This is a picture of the rebuilt school ninety years after it opened its doors to students. Click on the image to see the full-size photo. THEN This photograph was taken in 1880. The location is at the intersection of Nineteenth Street and Mission Street. 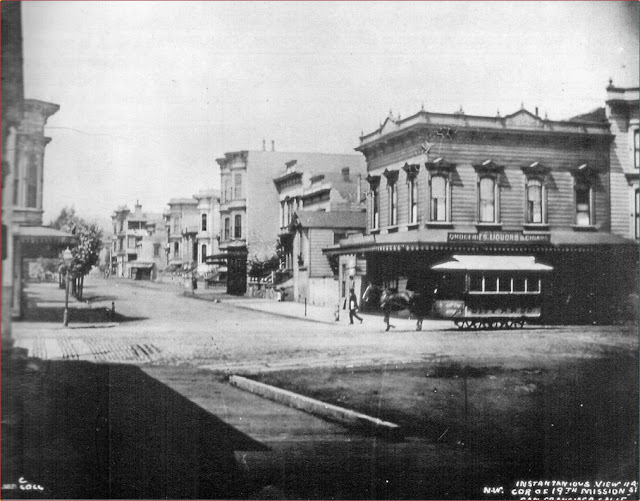 Please note the horse-drawn streetcar traveling south on Mission Street and the wooden plank sidewalks. This locality was destroyed in the April 1906 firestorm. (Courtesy of California Historical Society, FN-30768.) Click on the image to see the full-size photo. 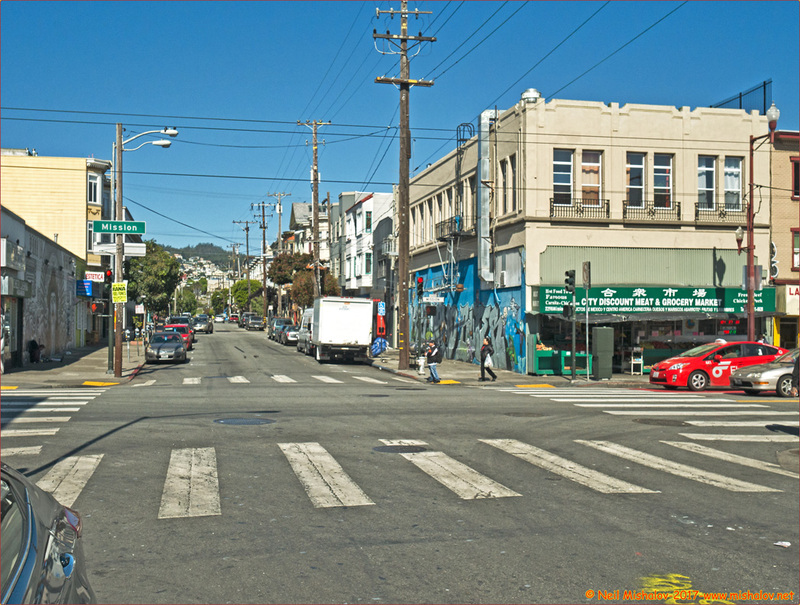 NOW This area of Mission Street is in the heart of the Mission District; it is busy and vibrant. Click on the image to see the full-size photograph. 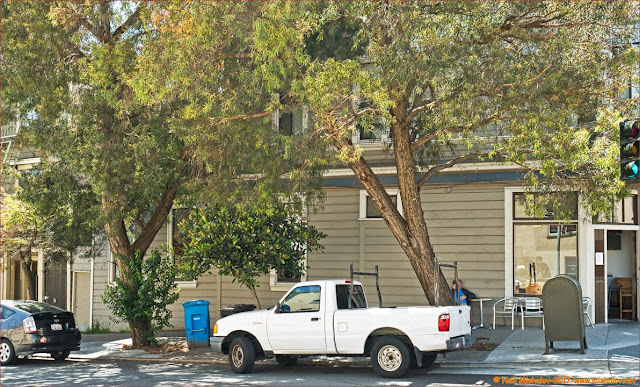 THEN This is 501 Capp Street. The cross street is Twentieth Street. The fire reached to within one-half block of this location. The picture was taken on 22 April 1906, four days after the earthquake. Please note the cooking stoves on the street near the sidewalk. They are on the street because immediately after the earthquake government officials instructed all residents of San Francisco to stop cooking food over open flames inside of buildings until further notice. There was a danger of additional quakes and ruptured gas lines. (Courtesy of California Historical Society, FN-34500.) Click on the image to see the full-size photo. NOW This is a quiet location. Click on the image to see the full-size photograph. THEN The bicycle ardor sweeping late-nineteenth-century America flourished in San Francisco. Despite the unpaved streets and dirt roads, many bicyclists, then known as wheelmen, rode their bicycles with great enthusiasm. The last two decades of the nineteenth century brought significant change for cycling enthusiasts. 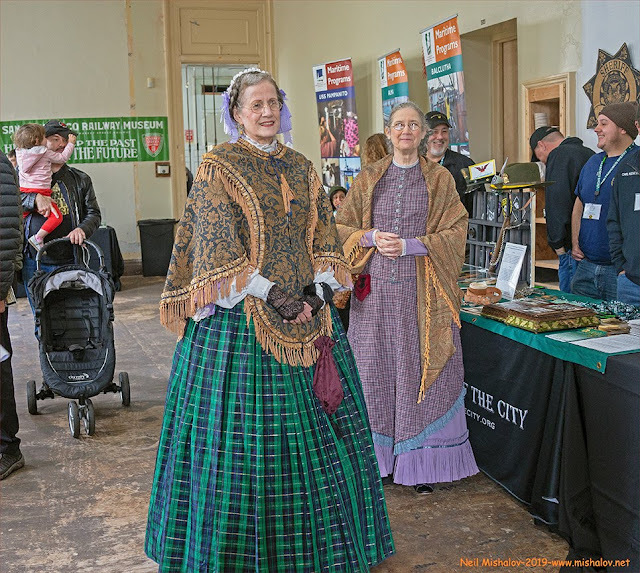 The League of American Wheelmen, established in 1880, advocated rider safety and helped to secure paved roads. The L.A.W. became the country’s premier bicycling association, providing the infrastructure for members to participate in races, learn riding etiquette, and access touring maps and other publications. 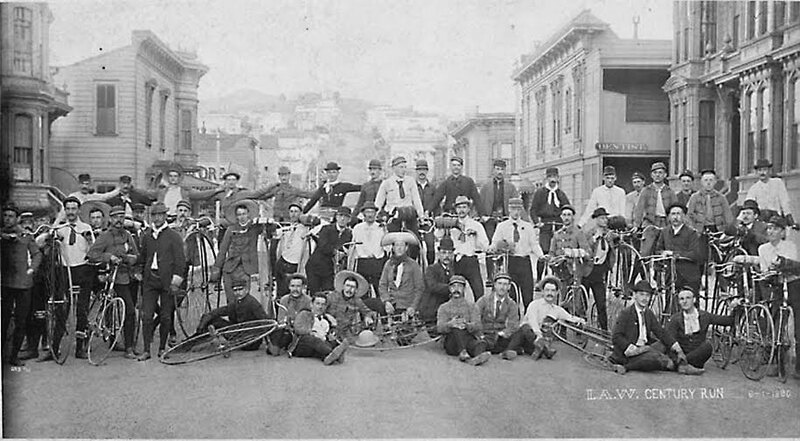 This picture shows a group of bicyclists in 1890 before they embark on a 100-mile bike ride sponsored by the League of American Wheelmen. 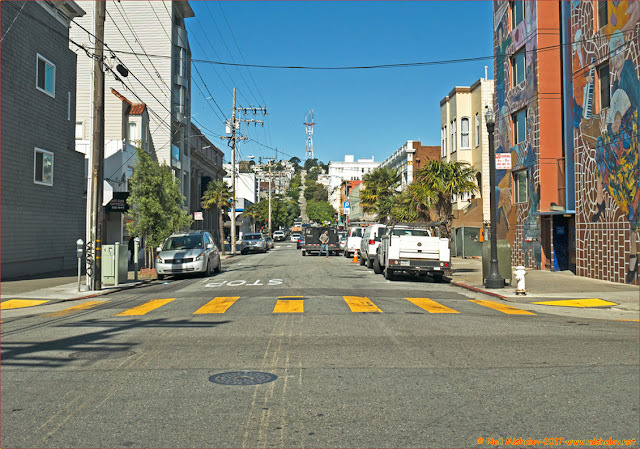 The location is at the intersection of Twenty-first Street and Capp Street. This spot is one and one-half blocks from the fire's border. The view is looking west. (Courtesy of California Historical Society, FN-06001.) Click on the image to see the full-size photo. NOW This is a quiet area in the Mission. Click on the image to see the full-size photograph. THEN This house, located at the northwest corner of Twenty-second Street and York Street, was built for the founder of the Old Milwaukee Brewery. The fire did not come close to this location. This picture was taken circa the 1930s. (Courtesy of Etienne Simon.) Click on the image to see the full-size photo. NOW The house has been well maintained, and the current owner is a dedicated gardener. The view is looking north. Click on the image to see the full-size photograph. THEN This picture was taken on Saturday, 18 December 1915. The location is the intersection of Twenty-sixth Street and Treat Avenue. This area was more than seven blocks from the firestorm boundary. The view is looking north. (Courtesy of St. Anthony-Immaculate Conception School.) Click on the image to see the full-size photograph. NOW A quiet area of the Mission District. Some of the houses visible in the 1915 photo are still standing. Click on the image to see the full-size picture. 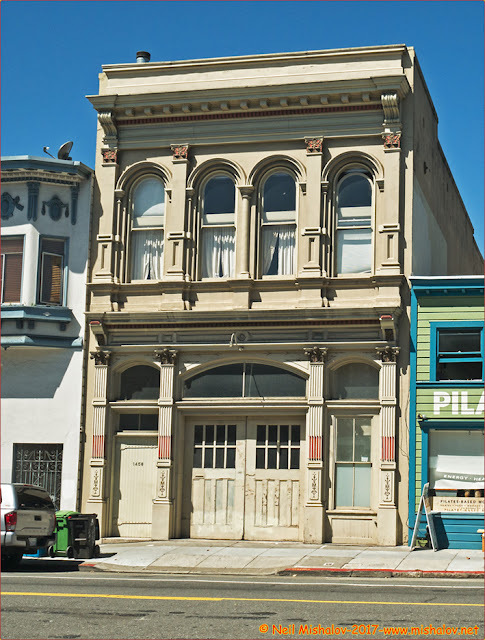 THEN Built in 1883, this is San Francisco's oldest standing firehouse; it is a brick firehouse that has a front surface made entirely of cast iron. It was the home of Engine Company No. 13 until 1958. The firehouse was sold by the City in 1959, and the building is now privately owned. This picture is undated. 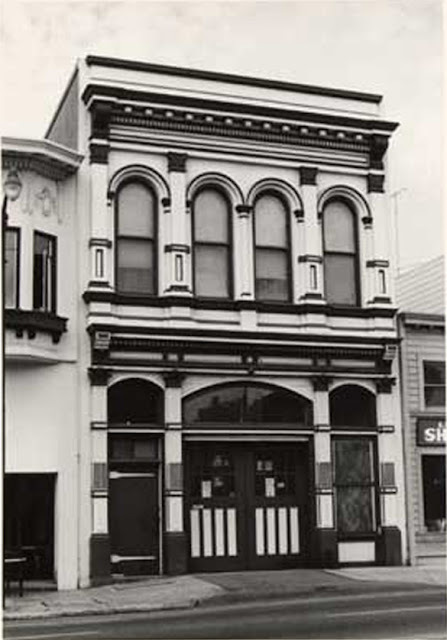 Since there is no sign on the building indicating that it is a firehouse, I believe the picture was taken after the building was sold by the City and County of San Francisco. I presume that the picture is circa the 1960s. 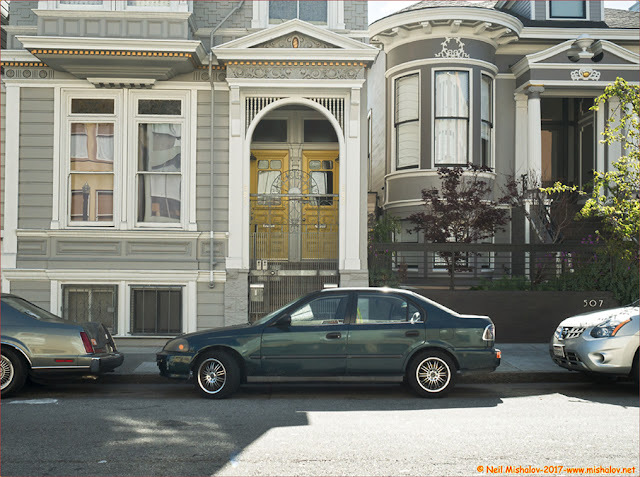 (Courtesy of San Francisco Fire Department.) Click on the image to see the full-size photograph. 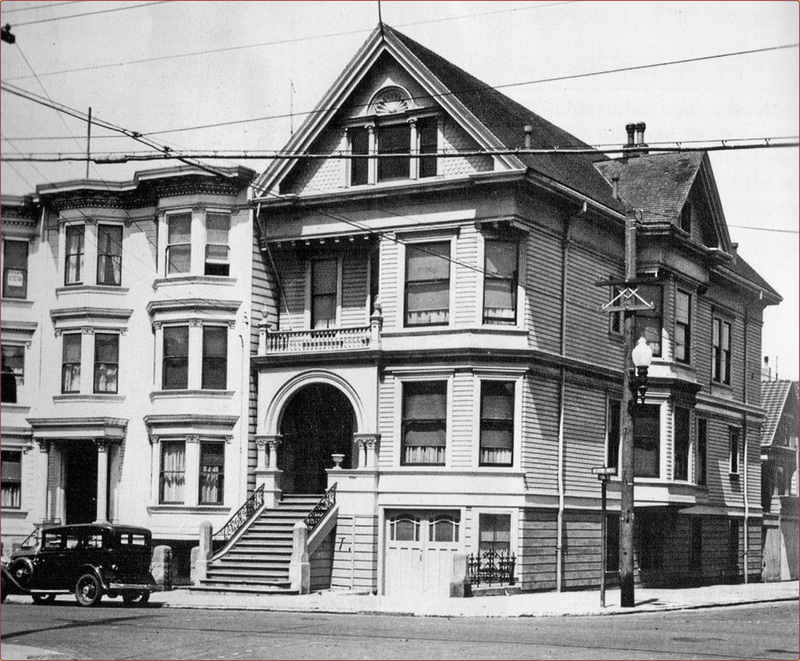 NOW The former home of San Francisco Fire Department Engine Company No. 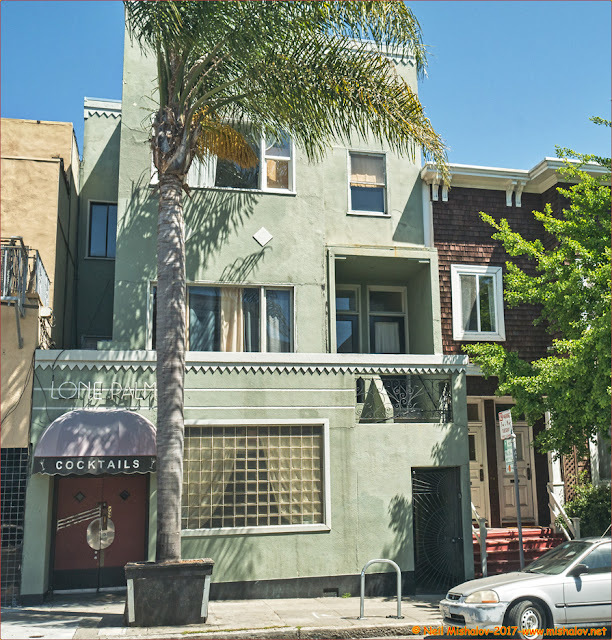 13 is now known simply as 1458 Valencia Street. Click on the image to see the full-size photo. 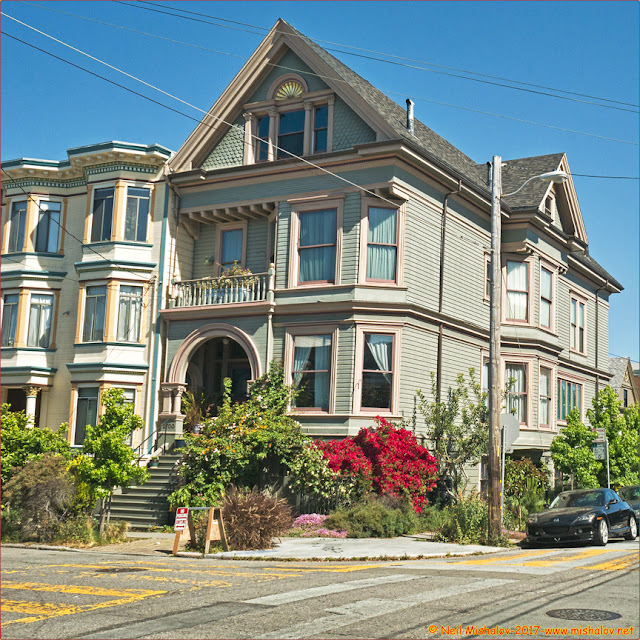 THEN Anthony Baciocco came to San Francisco from Italy in 1887. He was then introduced to Rosa Muzio, his future wife. Rosa and Anthony became the parents of six children; four girls, and two boys. 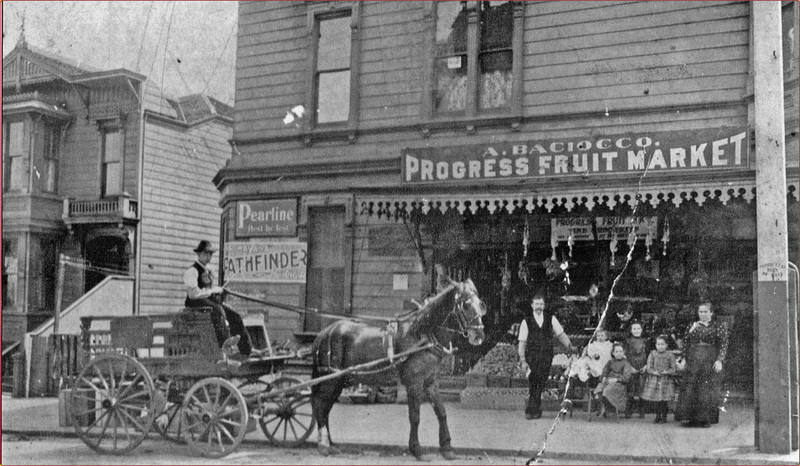 Anthony worked at a produce farm located in the Glen Park neighborhood of San Francisco before he opened Progress Fruit Market on Twenty-fourth Street at Guerrero Street. (Courtesy of the Baciocco Family). Click on the image to see the full-size photograph. NOW The building is still standing, but Progress Fruit Market’s large entryway on the Twenty-fourth Street side of the building has been permanently closed. The location is now occupied by a coffee shop with a conventional entryway. Click on the image to see the full-size photo. THEN Catherine Loftus was born in Ireland. She moved to 3392 Twenty-second Street with her husband and three children. 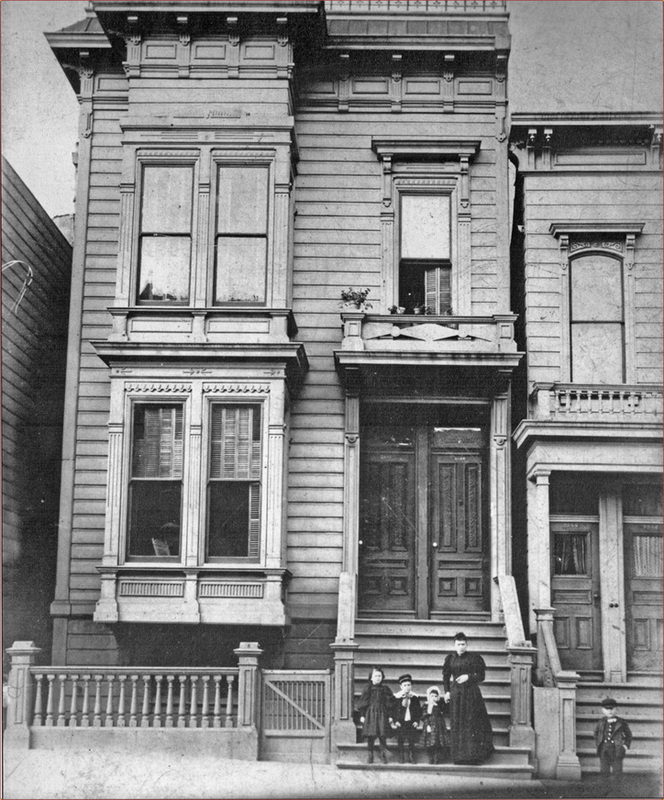 This picture was taken in 1897; it shows Catherine and her three children standing in front of the two-unit apartment building. (Courtesy of the Loftus family.) Click on the image to see the full-size photograph. NOW This is the same building; it has been significantly altered. The structure was raised, and a lower level was added to the building; the lower addition is now occupied by a liquor bar. The wooden exterior has been replaced with a stucco exterior; the windows have also been changed.The location is Twenty-second Street at Guerrero Street. Click on the image to see the full-size photo. The distance traveled was approximately 5.2 miles (8.4 kilometers). 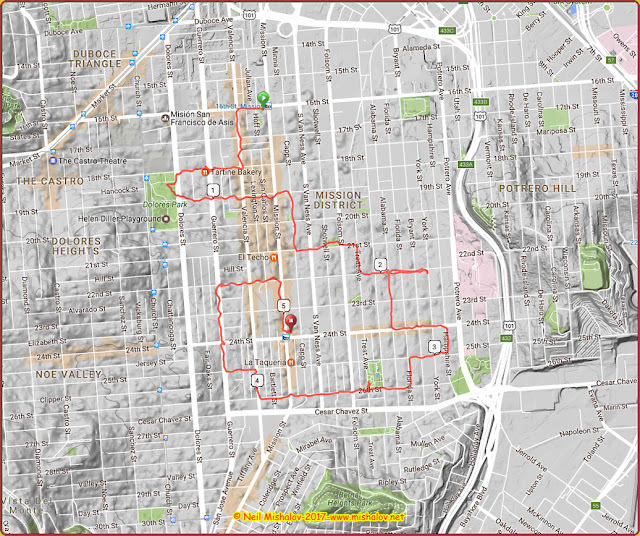 The cumulative elevation gain was about 223 feet (68 meters). Mile markers are displayed on the GPS generated track. Click on the image to see the full-size map. The book San Francisco’s Mission District was helpful in assembling this gallery of ‘Then and Now’ photographs.